Filed to: will the real ryan zinke please stand up?Filed to: will the real ryan zinke please stand up? 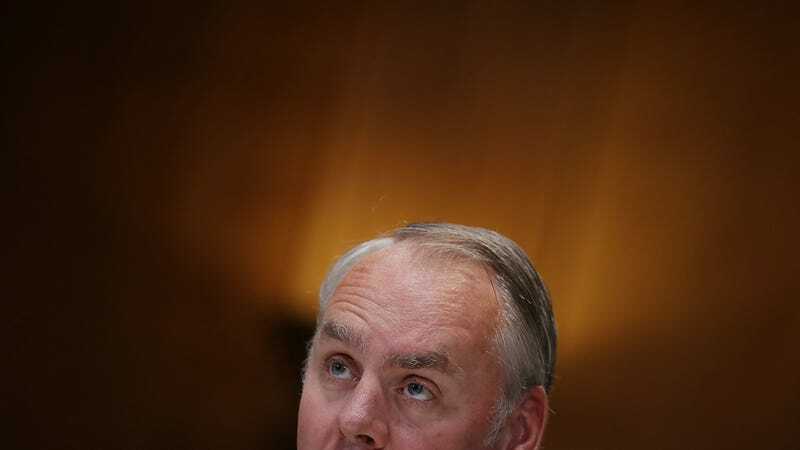 will the real ryan zinke please stand up? Park ranger cosplay enthusiast Ryan Zinke has had himself a couple of weeks. In the midst of a catastrophic summer of wildfires, the Secretary of the Interior has tied himself in knots trying to figure out how to talk about the role of climate change in driving those fires. Over the course of the past two weeks, he has alternately blamed the fires on fuel loads, environmental groups (or in Zinke parlance, “environmental terrorists”), bark beetles and the resulting dead trees, and poor management. He has said climate change plays a role, and noted that the climate is always changing and humanity’s impact is unclear. What is clear is Ryan Zinke is a confused man caught between opposing forces of science and politics. Let’s take a minute to relive his agony. Zinke’s grab bag of wildfire views first went on display in a USA Today op-ed, penned on the day it became clear the Mendocino Complex would be the largest conflagration in California’s history. The title? “Wildfires seem unstoppable, but they can be prevented. Here’s how.” The premise? Fires are burning more intensely because of poor forest management and hotter, drier conditions. A fair statement to be sure, but his solution is to more actively manage forests while calling out “radical environmentalists...[that] make outdated and unscientific arguments, void of facts, because they cannot defend the merits of their policy preferences year after year as our forests and homes burn to the ground.” He also invoked the loss of firefighter lives to discredit these unnamed foes, which is pretty gross. I and the vast majority of scientists are with you, Zinke. Can’t wait to hear how this will factor into your vision for managing fires. Just launch me into the sun. And whether you’re a global warmist advocate or denier, it doesn’t make a difference when you have rotting timber, when housing prices are going up, when a lot of Americans are right at that border of affording a house, and yet we are wasting billions of board feet for not being able to bring them to a local lumber mill. It is unconscionable that we would do that to our citizens. And that, my friends, is what this is really all about. The Trump administration has invested a lot of effort into ensuring that the fossil fuel industry has as many opportunities as possible to drill for oil and gas. Zinke has helped spearhead a number of those efforts from his perch at the Department of the Interior. He has also rescinded its climate change planning policies, further ensuring that “active management” of forest doesn’t mean considering the risks climate change poses. Of course, continuing to emit carbon like there’s no tomorrow will make climate change worse, and that will increase the risk of more catastrophic wildfires. Admitting climate change is a big driver behind the intensification of wildfire season would mean actually doing something about all that carbon pollution. The fires are also a politically expedient way to attempt to take control of California’s water use, including water that helps endangered species that the Department of the Interior is supposed to protect. The administration has also used the fires as a way to ram through an attempt to increase logging on U.S. Forest Service lands, something the Department of Agriculture (which oversees forests) is now trying to do. That same plan also mentions how the climate has changed without explicitly talking about what caused said changes, showing that the Zinke’s Department of the Interior is hardly the only agency trying to cope with reality.